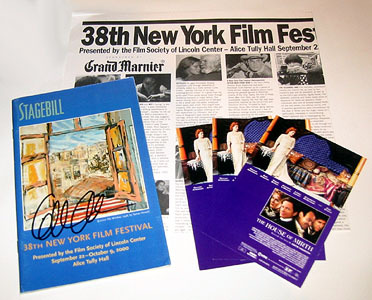 This item includes a Grand Marnier New York Film Festival flyer, an autographed program for the New York Film Festival, and three "House of Mirth" postcards. "House of Mirth" premiered at the New York Film Festival in September 2000. The program is signed by Gillian Anderson and comes with a Certificate of Authenticity from the Official Gillian Anderson Website.